15) Andrea Blanton / ? 59) Carrol Fields / ? 85) Anna Jean Hurlburt / ? 96) Teresa Lauderdale / ? 108) James McCarthy / ?
" The government is afraid of the guns people have because they have to have control of the people at all times.Once you take away the guns,you can do anything to the people.The government is continually growing bigger and more powerful,and the people need to prepare to defend themselves against government control. " " I can't attribute anything I am now to any lack of my parents' presence in the home...but I do say that I have very few memories of interactions with my parents. " " All you tyrannical mother fuckers will swing in the wind one day for your treasonous actions against the constitution of the United States. " " Shaken,disillusioned,angered that that could happen in this country,where our core beliefs are freedom and liberty.And what did you do to these people?You deprived them of life,liberty and property.You didn't guarantee those rights.You deprived them of them. " " For those die-hard conspiracy theorists who will refuse to believe this,I turn the tables and say: Show me where I needed anyone else.Financing? Logistics? Specialized tech skills? Brainpower? Strategy?...Show me where I needed a dark,mysterious Mr.X! " " Borrowing a page from U.S. foreign policy,I decided to send a message to a government that was becoming increasingly hostile,by bombing a government building the government employees within that building who represent that government. " After the devastating explosion took place in Oklahoma City,all officers in the vacinity were called to ground zero.One officer (Charles Hanger),was on his way to help when he noticied a yellow 1977 Mercury Grand Marquis being driven without a license plate;he stopped the vehicle and a young man stepped out-handing over his driver's license where his name was printed:Tim McVeigh.Hanger realized that McVeigh was carrying a weapon on his hip;after confiscating the 9mm Glock he also confiscated an ammo clip and a knife that were also on McVeigh.Hanger placed McVeigh under arrest for unlawfully carrying a weapon-transporting a loaded firearm in a motor vehicle-failing to display a current license plate,and failing to maintain proof of insurance.Back at the scene of the explosion,officials had found a truck that was used to set off the explosives:a Ryder truck.Luckily,the rear axle and the license plate were still in-tact after the explosion took place.They took the identification number from the axle paired with the license plate number,and computed a trace.Ryder Rental Agency in Junction City,Oklahoma came up as the Agency that had leased the truck.At the Agency,officials-with the help of a salesman-were able to come up with two sketches of the men who had rented the truck.The sketches were immediately posted all over news stations around the country,and by night,officials had a promising tip;a woman named Lea McGowen pointed out that one of the men had stayed at the motel she was the manager of (Dreamland Motel),and that his name in her registry book was Tim McVeigh.After furthur questioning with McGowen,she noted that McVeigh was usually seen driving a yellow Grand Marquis.A few days later,Hanger was running a background check on McVeigh's name,address,and the Marquis' registration number into Washington's National Crime Information Center,when suddenly it came up that officials were looking for McVeigh in connections with the bombing of Oklahoma City.Hanger contacted the officials and they quickly jumped flight to visit with McVeigh as he was being held in lockup.McVeigh did not confess during questioning,but there was no need for the confession since the physical evidence was extremely overwhelming.Officials did not hesitate in charging McVeigh with the bombing of Oklahoma City. 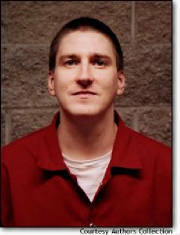 Before the trial took place,McVeigh was moved to Denver,Colorado to ensure that he would be given a fair trial.On April 24,1997-the trial began,and McVeigh pleaded not guilty.Throughout the trial,the prosecution called on at least 141 witnesses(including McVeigh's sister,Jennifer),while the defense only called on about 27.After the physical evidence was seen and the testimonies were heard on June 2,1997-after 23 and-a-half hours of deliberations,the jury came back with a verdict of guilty on all charges.Two months after the trial,McVeigh was sentenced to death by lethal injection.On July 13,1999-construction of the new Federal Death Row Institute For Men was finished in Terre Haute,Indiana.McVeigh was one of the first inmates to be moved to it's seclusion.McVeigh's original date of execution was for May 16,2001,but on February 13,2001-McVeigh filed for clemency which caused the execution date to be pushed back because of the large amount of death row inmates in the United States filing for clemency as well.During the time McVeigh's case was being reviewed by the parole board for it's liability of clemency,McVeigh brought even more controversy forward after requesting that his execution be televised live for all of the world to see.After word of McVeigh's request was out,networks from around the world stood up in support of his request and even took it to the desks of the F.B.I.,but McVeigh's request was denied under terms that "it's unconstitutional to broadcast an execution. ".A book was soon published before McVeigh's execution,where he finally confessed for the first time to bombing the Alfred P.Murrah building in Oklahoma City.On June 7,2001-McVeigh's request for clemency was denied,and five days later,around 7:14am-McVeigh's execution was carried out by lethal injection.McVeigh's body was cremated and his ashes were scattered by family members in an undisclosed location.